You have to be sure that you do not enter such trades randomly and anticipate what is going to happen because going against the trend is risky, that is why it is important to remember the last rules that were mentioned. If we go through it again quickly, nothing can pass point 1. If it does, then do not trade because it is too risky. Be sure if you are new to the binary options trading and analysis that you do not get confused with highs or lows. It is used for many years now which means it provenly tested it works. 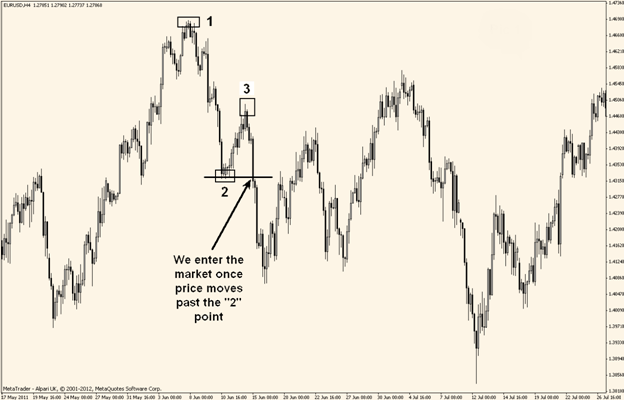 They use it in forex, stock trading with support and also resistance principle in mind. Now let us look at second example. You can see how all the highs and also lows are numbered. These are all opportunities which would be successful in this case. 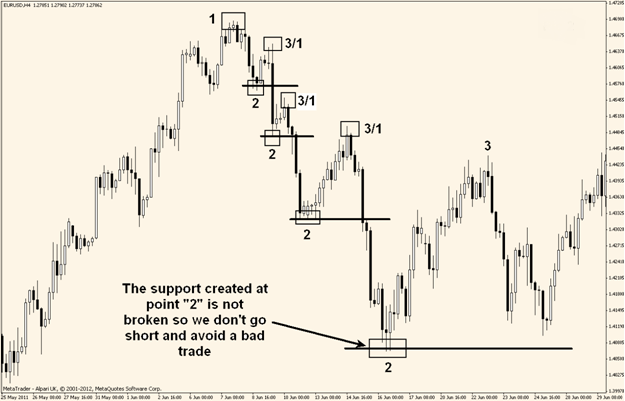 In this particular example, doing a trade is when 2nd point is broken. HOW TO START USING 1-2-3 STRATEGY? You definitely need to look at proper charting software and not on binary options platforms to use this strategy. Use japanese candles and time frame you like to trade but have in mind bigger picture of the chart if you are trading short terms. The best to describe it again is by picture so take a look and you will see. 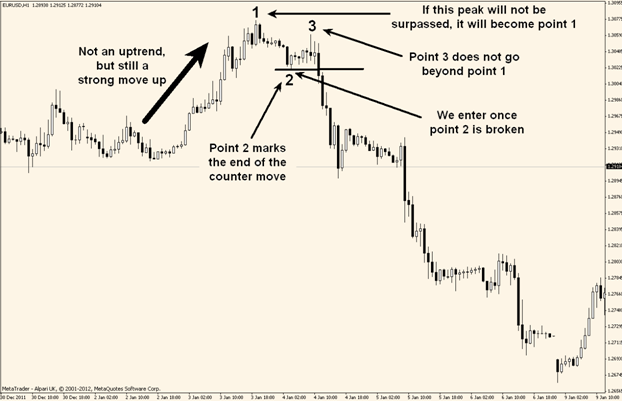 As you see from the picture, you ONLY do a trade when the point 2 is surpassed and not before. Same thing applies to uptrend just all is reversed basicly. Just have patience to wait for the pattern to reveal itseld and then take a trade. By not following the rules the trade can easily go against you. This strategy is among favorite ones because it is simple but it also has alot of profitabiltiy chance if used correctly as you can see. Of course you can not strike 100% of the trades simply because market is doing its own way that can not be predicted as you would want. Overally it is a good strategy for beginners to start with. I just could not leave your site prior to suggesting that I really enjoyed the usual information a person provide for your visitors? Is going to be again frequently to investigate cross-check new posts. will readily share this with my followers.